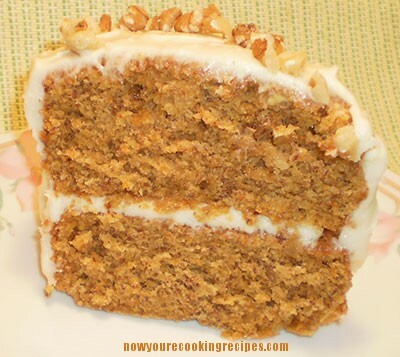 Cute Little Gluten-Free Carrot Cake - Now....you're cooking! I don’t make cakes too often, unless we are having company, or taking it somewhere. There is only my husband and me, and if I made a whole cake, well, then we would have to eat a whole cake. Well, I was in the mood for carrot cake and I got the idea from a blog post to make a mini-carrot cake. 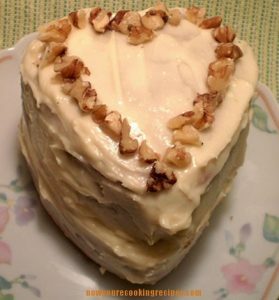 I happen to have two 4″ heart shaped springform pans that I used to make this into a little layer cake. 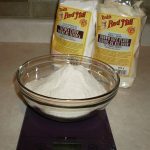 This is the gluten-free flour blend I used. Preheat oven to 350 degrees F. Spray two 4" pans or ramekins with non-stick cooking spray. I mixed this up in my mini food processor/chopper - you could also use a blender. In bowl of food processor or blender add the canola oil, sugar and egg. Mix for about a minute. Add the vanilla and grated carrot and mix for about 30 seconds. In a small bowl, combine the flour, flax meal, cinnamon, baking powder and salt. Sprinkle over wet ingredients and whirl until well combined. Pour batter into prepared pans and bake in preheated oven for about 25 to 30 minutes. Cake should spring back when lightly touched. Remove cakes from oven and allow to cool on wire rack. Combine all ingredients until smooth and creamy.I also used the mini-chopper to do this. When cakes are completely cool, remove from pans. Set one cake on a serving plate, and spread a spoonful of icing over it. Top with the second layer and frost the top and sides of the cake with the remaining icing. Garnish with additional chopped walnuts if desired.